But you’re not done with summer yet! 1. You’ve only read three out of the 87 books in your “I’ll totally get to these this summer” stack. 2. The back-to-school teacher nightmares have begun. 3. Your favorite co-teacher just let you know that they’re not returning this year. 4. The co-teacher you dread working with just told you they’re not retiring after all. 5. Your principal wants to meet with you to talk about some “red flag” kiddos in your class. 6. You’ve been hearing about the incoming class since they were kindergarteners—and it’s not good. 7. You haven’t gotten your class list yet. 8. You’ve gotten your class list, and it’s really long. 9. You can’t decide between shiplap or burlap as a class theme. 10. Your teacher bestie was moved to a different grade. 11. You still can’t get into your classroom to start setting up. 12. Your schedule changed, and you won’t be able to use the bathroom until 1:30 PM. 13. You’re pretty sure you’ve already exceeded your allotment of copy paper just by printing your first-day materials. 14. You like eating lunch at normal speed, and you know you’ll soon have to scarf it down in four minutes. 15. You’re not as tan as you promised yourself you’d be before heading back to school. 16. Your grade level team picks a group theme idea you hate. 17. Target has put out the BTS materials and you’re furious—but FLAIR PENS! 18. You just know you’re going to spend the in-service days looking at last year’s data instead of being allowed to set up your classroom. 19. You had a brilliant idea last night and now want to redesign your entire first unit. 20. Just the thought of having to wear real shoes seems unbearable. 21. You’re going to have to seriously curtail your swearing. 22. Your school isn’t air conditioned, and the first day of school is in mid-August. 23. You haven’t finished binge-watching everything on Netflix. 24. You just got your kids’ BTS supply lists and realize you forgot to include hand sanitizer. 25. Your dog just won’t understand why you’re suddenly leaving him again. What else is keeping you up at night as you think about heading back to school? Share in our WeAreTeachers HELPLINE group on Facebook. 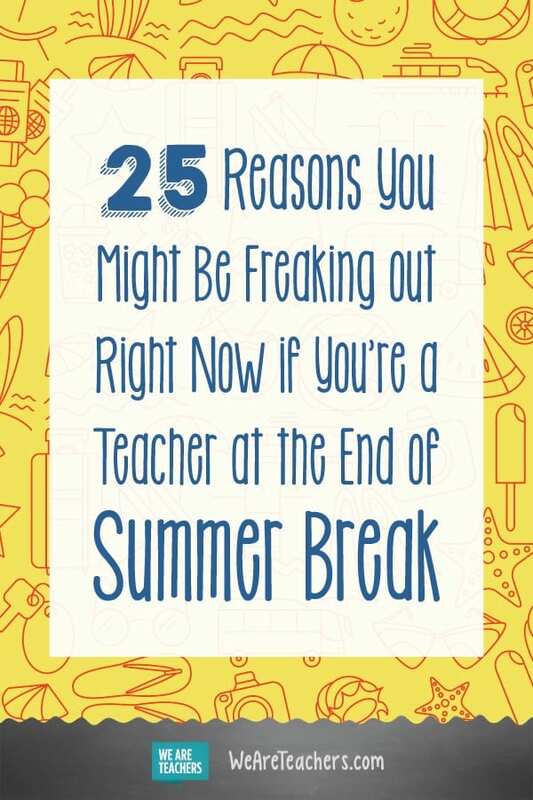 Plus, check out our definitely relatable “Said No Teacher Ever” post.